Introducing the Miami AirJet Hot Tub by SaluSpa, this luxurious and premium looking Hot Tub is designed to be taken anywhere you go on vacation. At its incredible price of almost $500. 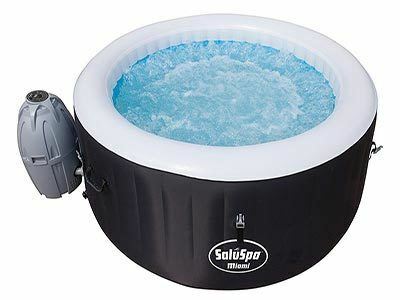 it can do what most inflatable Hot Tubs in its range can do, and even more. The beautiful look of it and feel will give you the impression of being in a professional grade Hot Tub. Designed for anyone who uses it, starting from kids to parents and even business men, it’s the perfect choice for anyone. The Miami AirJet Inflatable Hot Tub by SaluSpa comes in a very beautiful black color giving it a premium look. Constructed using a TriTech material it features a 3-ply reinforced material made of a polyester mesh core, enclosed in two layers of laminated PVC. TriTech is used for high durability and strength that is not available in other spas of this range. The walls of the Lay Z Spa Miami are manufactured using I-Beam technology, designed to be puncture-resistant and allows anybody that uses it to sit on the walls without the Hot Tub to bend, giving it superior characteristics compared to other Hot Tubs in this class. The control panel can also be used to select the desired water temperature which can go up to 104 degrees Fahrenheit. In the included features the Miami AirJet Hot Tub also includes a Rapid heating and water filtration system and an automatic start-stop timer for controlling the heating system. Setting it up is extremely easy, it inflates using the pump that comes with it and no other tool is needed. Inflating takes about 10 minutes and another 30 minutes to fill up with water, as a tip you could use a water source that has warm water, this way you can enjoy a warm bath and massage much faster. When done with it make sure to put the cover on so the water will stay warm and clean for the next time you want to use it. Other items that come with it are a Chemical floater for clean and fresh water for your Spa, a Filter Cartridge to help the water filtration System and a DVD that explains everything, from how to set it up to maintenance. The luxurious and comfortable Miami Hot Tub is indeed designed for the adventurous kind of people but it can also be just as practical and fun for the whole family. Because it’s slightly smaller than other inflatable Hot Tubs in this range it’s perfect for the kids, you can enjoy your time as a parent and leave them to play in the water as much as you want. Also, when they’re done playing and off to sleep you can enjoy some time alone with your spouse in a warm and relaxing Hot Tub. The size and weight of the Miami AirJet Hot Tub make it perfect for most of the persons. There are no seats, so you may have to purchase additional cushions, the ones that fill up with water are recommended by most users. There are no lights, but that’s not such of a big deal, you could just use another source of light. Takes a good time to get the desired temperature. Question: How to drain water from the tub? Answer: There is a garden hose included with this hot tub to drain the water directly to the garden or elsewhere. Question: What is the water capacity of this Hot Tub? Question: How much time needed to reach the temperature of the water in the Hot Tub to 104 degrees? Answer: Like the most of the Hot Tub, this one also needed a good amount of time to reach the highest temperature. You should plan at least 24 hours to reach the highest temperature of the tub. Question: What chemicals are needed to maintain this Hot Tub? Though you will find a lot of hot tubs with the same features but this one is popular because of the price of the product. Also, it is one of the best durable hot tubs. Customers who have purchased this hot tub are highly satisfied with the quality. You can stay secured for a long time with this hot tub. You can enjoy this hot tub in your home or outside. It will make you relax after a long day work. If you have a lot of stress and you want to make your everyday life better than the previous, you should order this hot tub.